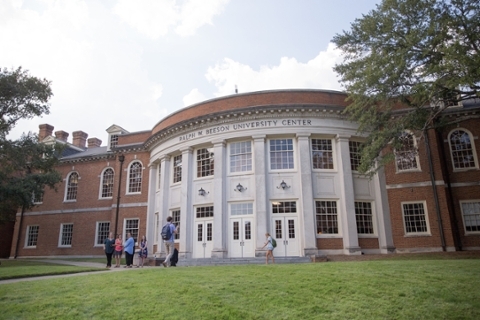 The Samford University community will benefit from major upgrades to the decades-old Beeson University Center, thanks to renovations that will begin May 14 and continue through the 2018-19 academic year. The project was approved May 1 by the university’s board of trustees. When renovations are completed, the building will feature new student gathering spaces, an expanded food court, a renovated bookstore and new offices for the Division of Student Affairs. The cost of the project will not exceed $16 million, according to university officials, and is part of a multiyear campus master plan. The enhanced space is expected to be a destination place for students to gather, collaborate, eat, study and attend events, according to Kimberly S. Brown, Samford’s associate vice president for operations and campus initiatives. As part of the project, the university is working to minimize disruptions in food service for students, according to Harry B. Brock III, Samford’s executive vice president and vice president for business and financial affairs. The university’s main dining service, known on campus as the “Caf,” will be temporarily relocated to Seibert Hall from May 25 until July 9 because of infrastructure upgrades in the University Center. Plans are being made to provide full service dining in the temporary location, and the Caf in the University Center will be open throughout the 2018-19 academic year, Brock emphasized. The planning phase included partnering with Samford’s interior architecture students who developed beautiful designs for the space, Brown said. Several common themes emerged from the student designs which are being implemented in the space, such as opening direct access and sight lines from the University Quadrangle, entrance to Harry’s Coffeehouse, the food court and the bookstore. New entrances and lobbies will be designed from the Quad and Talbird Circle that will feature student gathering spaces. For the new entrance off the University Quadrangle, offices currently on the first floor will be relocated and the new space will include comfortable seating and student gathering areas. For the new lobby off Talbird Circle, offices currently in that space will be relocated, the third floor will be eliminated and a more open atrium-like gathering space will be featured with a sky-lit stairwell connecting the first and second floors. The university bookstore will be updated with display windows and new entrance from Ben Brown Plaza. The food court will be expanded, and tentative plans are for a full-service Chick-Fil-A and the addition of a Moe’s Southwest Grill and a coffee house to go with other food options. The food court will remain closed into next academic year, Brown said, but other food service options will be available with the Caf, Einstein’s Bagels in Harwell G. Davis Library, Freshens in the College of Health Sciences and food trucks where students can use Bulldog Bucks. The student gathering and event space called Harry’s Coffeehouse will be completely renovated with movable walls to provide open space for students and dining or enclosed space for special events, with an adjacent courtyard revamped to become an outdoor extension of Harry’s. The University Center Annex and current space occupied by the journalism and geography departments, as well as all classrooms, will be renovated into office and meeting space for the Division of Student Affairs. The two academic departments will relocate this summer as part of renovated spaces for Howard College of Arts and Sciences. Other plans for the building include additional meeting and event spaces and upgraded restrooms. During the renovation, several university services, including the bookstore and post office, as well as other offices will be relocated on campus. Before these improvements can be made, however, significant utility infrastructure upgrades will be required, Brown explained. This work includes replacement of plumbing lines, major modifications to electrical and HVAC systems, and a kitchen remodel, which necessitated the temporary closing of the building. A final timeline for the project has not been set, Brown said, although the main university dining hall will reopen in mid-summer. She added that updates will be provided to the university community throughout the months ahead.